The Dell UltraSharp 24 InfinityEdge U2417H is so called because of its ridiculously slim outer borders. When the screen is off you’ll be forgiven for thinking there is no border at all. Of course there is one there but is a tiny 5mm thick which is pretty good going by current standards. If you’re looking for a few screens to match up next to each other then the U2417H is going to be right up your street. 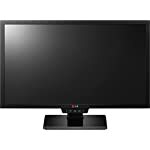 The screen offers a 60hz refresh rate and a standard HD resolution. 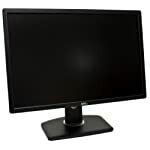 Whilst billed as a 24″ monitor it’s actually a tad smaller, measuring in at 23.8in across the diagonal. With a 1080p resolution this works out well. Sure, 1440p and even 4k are becoming more popular but at this size the higher resolutions would be a waste of pixels. We’ve already mentioned the fantastically slim surrounding bezels on this screen. 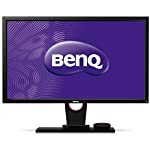 At just several mm thick its one of the slimmer options out there so ideal if you are looking for a dual (or more) monitor setup. The Dell has decent connectivity, you are free to utilise one or more of a selection of ports from HDMI 1.4 (MHL 2.0), DP 1.2, mini-DP 1.2, DP-out not to mention the 4 USB 3.0 and audio line-out sockets should you need them. The stand allows for the full range of movements hoped for, tilt, swivel, height. The quoted 8ms response time won’t win any speed prizes but when “fast” mode is activated this drops to 6ms. Gamers might be distracted by these figures but these are normal times for an IPS based screen and to be honest it’s plenty fast enough. The improved picture quality makes up for this. If you are dead set on the fastest then you might want to look at a TN panel. The out of the box image quality is excellent, as you’d expect from the UltraSharp series. That’s the good news. However there’s nothing in here to appeal directly to gamers. Don’t get me wrong, you’ll get a decent enough performance and a great looking picture. 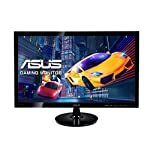 But if you want a monitor built for games this won’t be 1st choice. Professionals who want a top quality image will be more than happy thanks to a boat load of options for adjustment and colour matching. Dell screens have a good reputation for shipping with a great default setup. We give the Dell UltraSharp U2417H a 4.5 out of 5 rating. Want to know what existing owners of the monitor think? You can read real user reviews here. 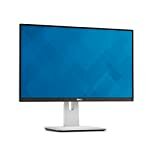 Should I buy the Dell UltraSharp U2417H? With great out of the box image quality the Dell has a lot going for it. That said, it is perhaps aimed more at the business PC owner than the gamer. That doesn't mean you can't game on it but it lacks the specialist game friendly features that come with pricier rivals. If you are having some doubts about this purchase then why not read some real owner reviews and see what other buyers think.